My husband has a really great way of calming me down when I get too stressed out. I am feeling much better today after spending a good two hours talking everything through with Nick the other night. We talked about everything from my large workload with the business down to how much I've been struggling with my eating habits and lack of self-control these past two weeks. I don't do well when it comes to doing things on the fly. I mean, I am okay with it to some extent. It kind of comes with the territory when you're the parent to a toddler. Not everything goes according to plan and I get that; it's just, I struggle when there's no plan at all. That's basically how I've been functioning these past few weeks -- no plan Stan over here. Between getting the flu, to saying goodbye to my childhood home and helping my mom move residences, to trying to dig myself out of a lot of work at home and with my business -- I am just ready to start focusing a bit on myself and my health again! I have been white-knuckling my way through these past few weeks, trying to do it all and do it all well, and it just finally all caught up with me the other night. I think we all have to go through those times. Where we stay strong for so long and then all of a sudden we break down. It wasn't even over something big. I guess that's how it usually works though; it's usually something little that ends up being the thing that does us in. The important thing though is how we handle ourselves after we break. 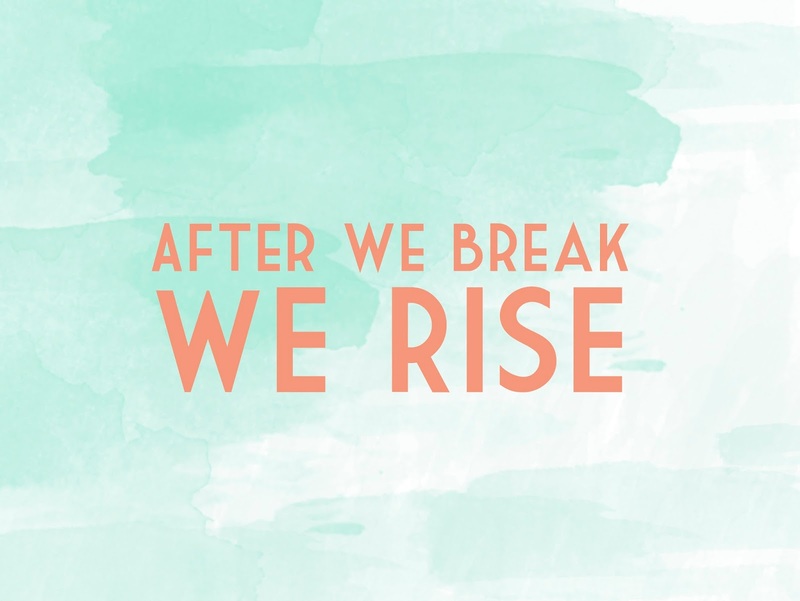 After we break, we rise. I feel very little shame in admitting that I broke down -- it doesn't mean I'm weak, it just means that I was tired after being strong for so long. It all caught up to me. After getting everything off of my chest the other night with my husband, I feel like I hit the factory reset on myself. I feel good as new, or nearly new. My husband and I discussed some things we're going to try to do to help get us back on track with our weight loss. We were able to lose 15 pounds together from January through the end of March. Now that it's nearly the end of April, we are ready to start losing more weight again. We have come up with a new challenge for ourselves, one that we will fine-tune this weekend and I will be happy to share with you on Monday, next week! It sounds like through the ashes you are rising and I guarantee you will be stronger and better!!! !